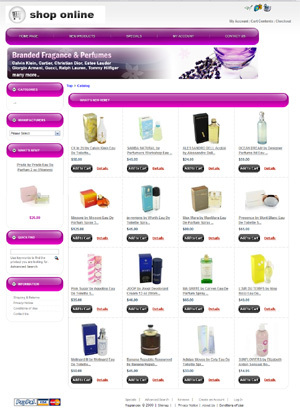 Get A Fragrance Dropship Website Loaded With Products From FragranceX.com. This offer is perfect if you like to start your own fragrance e-commerce website. More and more people are starting a home business and dropshipping is the easiest, fastest and most affordable way to get started. FragranceX.com will ship the products for you and wholesale2b will create and maintain your website for you. In fact you dont have to spend a dime to get started! Start selling 100% authentic brand name Fragrances, Perfumes, Skincare and cosmetic products online through your own website. Your website will be loaded with brand name products such are Adidas, Anna Sui, Calvin Klein, Chanel, Coty, Davidoff, Diesel, Disney, Elizabeth Arden, Escada, Estee Lauder, Giorgio Armani, Giorgio Valente, Gucci, Guess, Hugo Boss, Iceberg, Instyle Parfums, Jaguar, Joop, Marcella Borghese, MICK MICHEYL, Nina Ricci, Oscar De La Renta, Prada, Princess Marina De Bourbon, Ralph Lauren and so on. Instead of doing it yourself, save time and thousands of dollars by letting us build a website loaded with fragrancex products for you. Singup for a free account today and review our dropship products and wholesale prices before deciding on activating your dropship website plan.